Salumi power: Boutique American pigs, butchered in house, cured by a man named Bernardo. Down the steps to the bar and communal tables with tell tale views into the kitchen. Well, it looks like a prop master’s Italy, rough brick, tin, canvas banquettes and pillows, wood salvaged from the original Great Jones Lumber Supply, crocks and urns and farm tools everywhere, artist Warren Muller’s clever chandeliers overhead, the husky chef in his denim apron commanding the open kitchen. 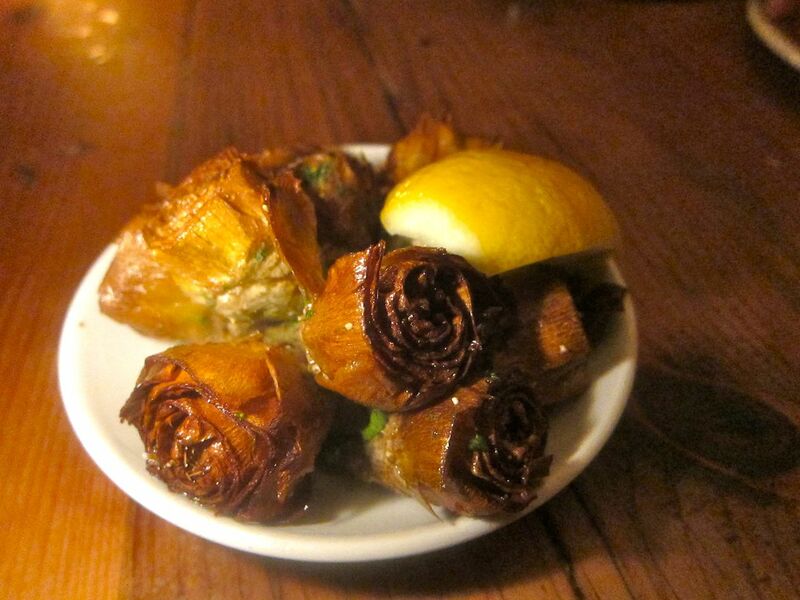 Baby artichokes fried to a delicious crisp. Bet you can’t eat just one. 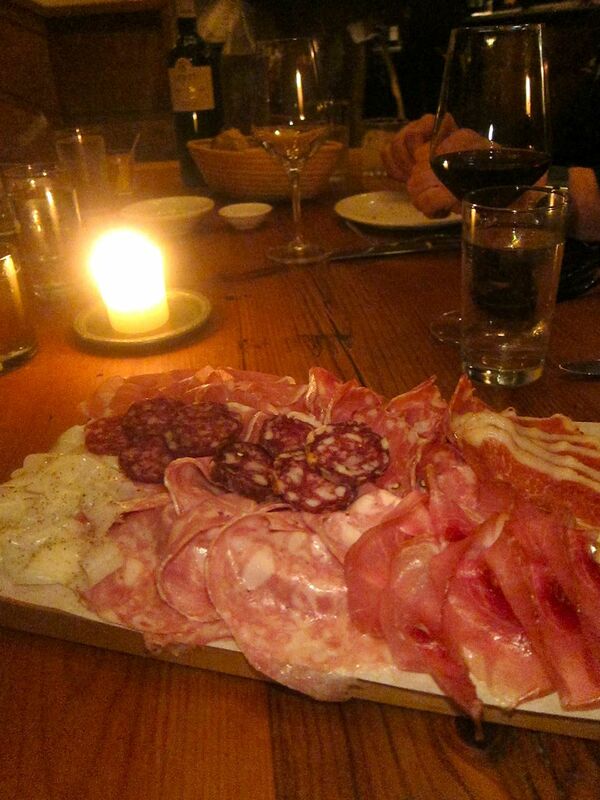 The house has sent a platter of salumi: peppery Tuscan sausage, capocolla, gossamer shrouds of lardo. “I can taste the fennel,” someone else muses. 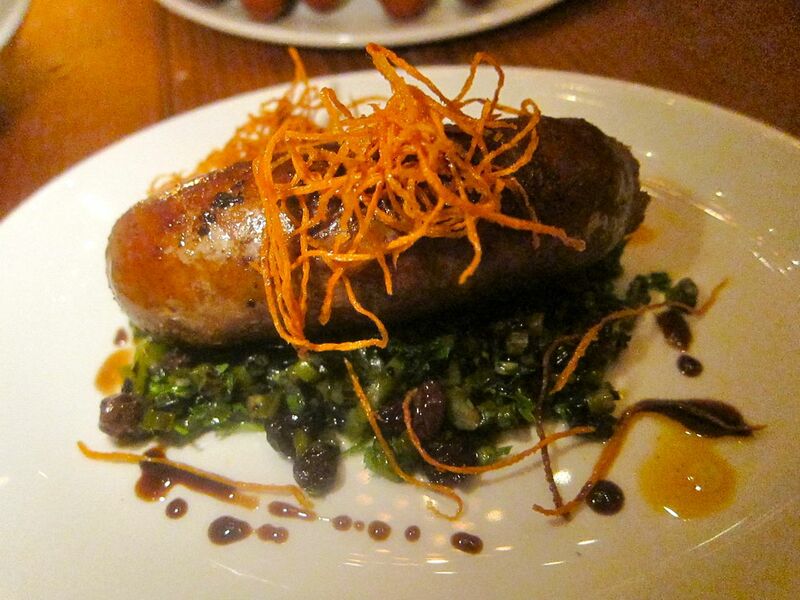 Charred garlic scapes, currants and carrot crunch make it springtime for sausages. Seared cuttlefish swim with black garlic and puffed barley. Who would have thought of pairing sausage with charred garlic scapes, currants and crispy carrots? 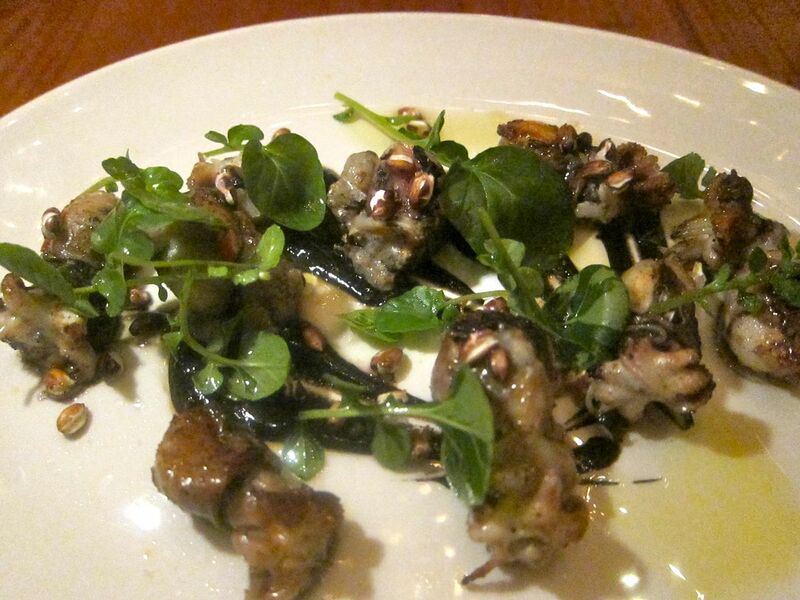 The cuttlefish a la plancha is an original too: seared with black garlic on a rubble of puffed barley. These pretty sculpted pods could be a jeweled brooch by Cartier. 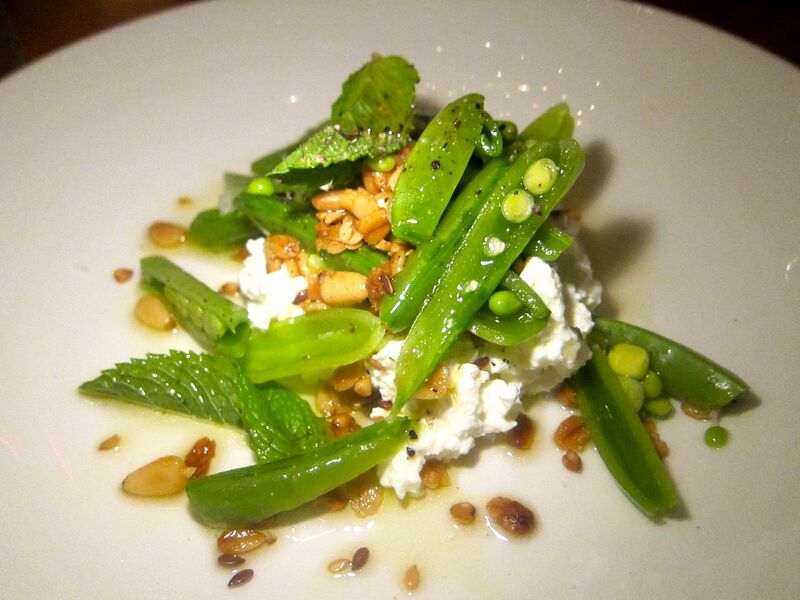 Now most of us are huffing and puffing and kvelling over what is modestly billed as ricotta and peas. It’s as if I’ve never seen a pea so revealed as in this amazing sculptural cut of the knife. It might have been a jeweled pin by Cartier. “It’s just a pea,” murmurs a friend not used to such exaggerated fervor at table. “Now I really know I’m in Italy,” my blissed-out pal announces. And that was on just one cocktail. 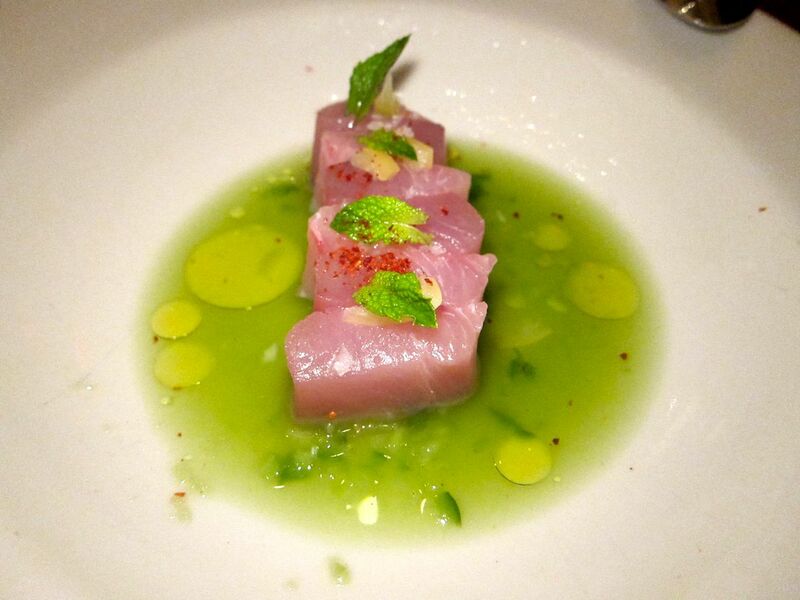 The chef sends us Spanish mackerel crudo with green radish, cucumber puree and limequat. Actually, I cannot imagine raw peas-in-the-pod so exquisitely sculpted, much less served in some Tuscan country inn. Crudo may have caught on all over the boot by now, but this couturier cut of Spanish mackerel with green radish, the cool of grated cucumber and the juice of limequat could scarcely be imagined in Umbria, much less Calabria where they do eat tiny neonatal raw. The asparagus are slivered, blanched maybe but tasting raw, sprawling over a poached egg. In Italy a trattoria or gastronomica with tables in the back room might very well cure their own meats as the house does here. Il Buco A & V owner Donna Lennert and her partners financed a costly apparatus in the cellar and imported experts to supervise the cured meat production. Only the 1% of pigs with enough honest fat, properly raised upstate and on selected Southern Farms will do. And Italy’s little country inns get bread from the local bakery. 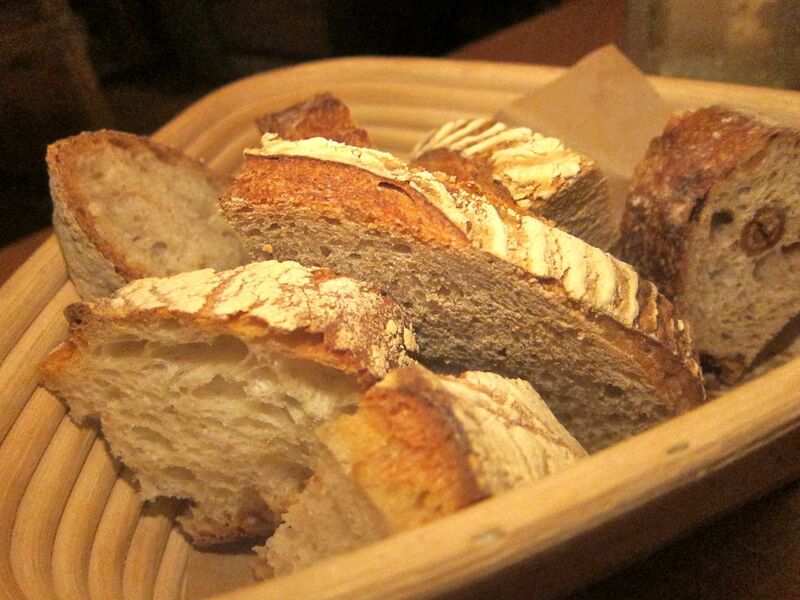 They are not likely to bake their own from whole grain and lazy, long fermentation as Kamel Saci does here – certainly not the half dozen varying loaves like those sliced for the molded clay basket on our table and for sale in the grocery store up front. There are a dozen in the retail bins, two in our basket. (I asked the bus boy to bring us more and fell in love with the fig and nut loaf. The olive bread was already gone). A taste you’ve never tasted before thanks to the chef’s alchemy with short rib. Then, to uncontrollable gasps, the already legendary short rib arrives, a blackened crusty monster wrestled to the platter on its bone. For a moment we can only stare. Who will wade in? Our squealer forks a piece and moans in ecstasy. Yes, it is remarkable, unimaginably tender, fatty, of course, the celery, horseradish and bright green olives balancing the richness with salt and bitter, plus a scattering of walnuts for no reason at all. But, then why not? The beef has been brined, salted with the Sicilian elixir of anchovies, colatura di alici, marinated with crushed peppercorns for 24 hours, then slow roasted. No one whose food I’ve ever tasted in Italy or anywhere else could dream up this animal. It is Chef Justin Smillie’s Demoiselles d’Avignon. 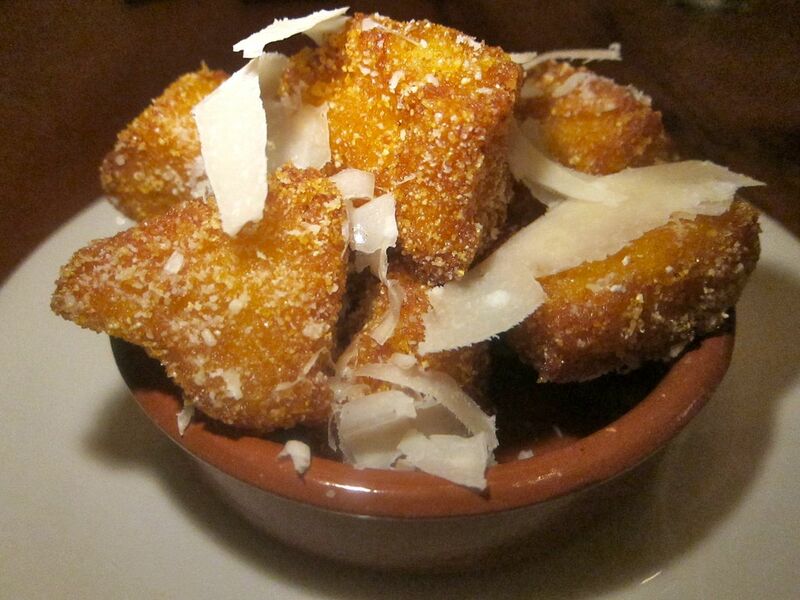 Polenta triangles are remarkable for an astonishly crunchy crust, a $7 side. Crunchy triangles of polenta and simple broccoli rabe are perfect sides if you insist. A collection of organic Umbrian beans cloaked with a little lardo is more enticing than the slightly too cooked grilled sea bream with a salsa verde we could have done without one evening. The young chef Justin Smillie makes a late night exit carrying his knifes and a doggy bag. 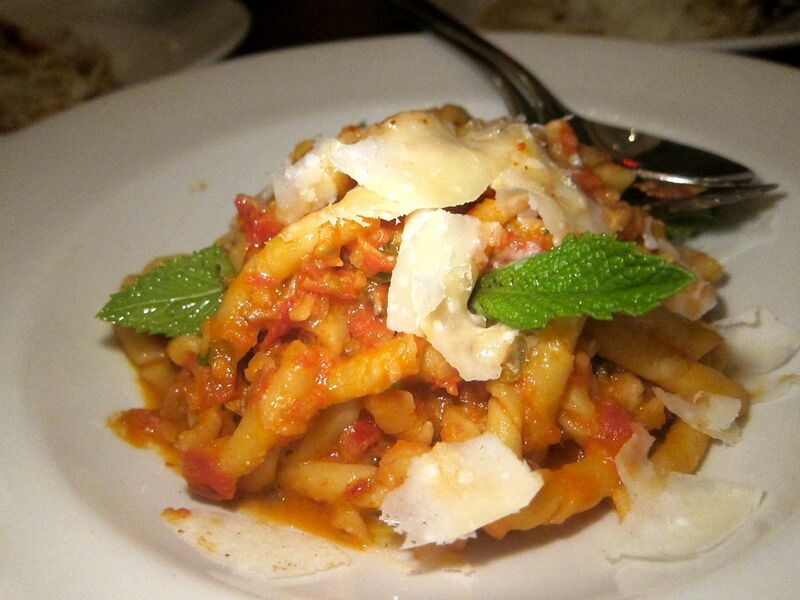 Pastas rotate on and off the menu. But housemade corkscrew busiate with almond and anchovies stays. Granted, Smillie’s pastas could pass for Italian: bucatini cacio e pepe (with black pepper and pecorino Romano), spaghetti (salted with bottarga of red mullet), my favorite cork-shaped busiate (a salt sampler of anchovy and capers animates, with an almond crunch), and the ruffled housemade lasagnette (tossed with rabbit, greens, olives and parmigiano). Half moon ricotta-stuffed ravioli are tossed with nettles and hazelnuts. I’m not normally a ravioli fan. But these little pockets of ricotta studded with hazelnuts are tender and sophisticated, tossed with nettles. At one dinner all the pasta primi are shockingly firm; just this side of al dente. At my return tasting, the discipline has relaxed and they’re now mellower. My least favorite starter is the lackluster grilled quail with spring onion relish. Dessert may seem excessive, even overkill at this point, but quite frankly, all are modest and mostly delicious, especially the zabaglione with strawberries and the chocolate budino layered with espresso mousse and whipped mascarpone. A line up of mostly very good gelati and sorbetti with five forks so we can all taste. A few drops of the 10-year-old balsamico would be enough for the panna cotta. Our exuberant busser, short and solid with an astonishing coif - not a busboy, not the waiter - speedily ricocheting around the room, is an effusive host. “Are you happy with everything so far?” he asks with a grin, already knowing the answer. He pours a river of vinegar. 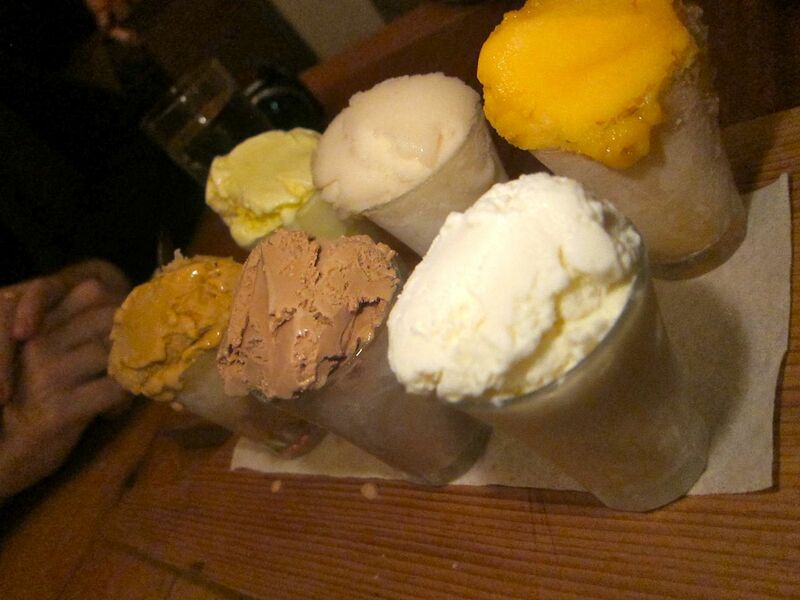 Gelati and sorbetti are heaped into small liquor glasses and lined up on a wooden board. Dig under the too salty top layer to get at lush caramel flavor. 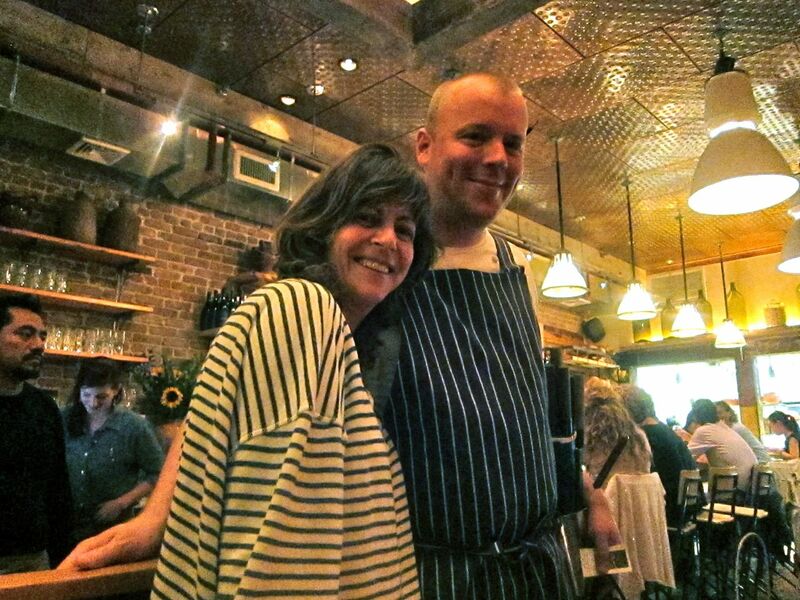 Donna Lennard drops by late from the original Il Buco on Bond St., poses with the chef. I wish I lived close to this corner of NoHo instead of $22 away on the meter so I could come by for a breakfast bread tasting, or the egg baked inside filone bread with tomato jam. Or sneak in to have that marvelous short rib sandwich at lunch. Disparate parts, tools, toys and know-not-whats make a brilliant Muller chandelier. Donna Lennard and Alberto Avalle started with antiques and Muller’s chandeliers around the corner at Il Buco on Bond Street thirteen years ago. The artist now sells pieces made from Mini-Coopers in his Philadelphia studio for $200,000 and she has created her grocery store and wine bar dream of Italy on Great Jones. As you have read here, I’m totally smitten. 53 Great Jones Street between Bowery and Lafayette. 212 837 2622. Breakfast, Monday to Friday, 7:30 am to noon; Saturday and Sunday, 9 am to noon. Lunch, noon to 3 pm daily. Dinner, Monday to Thursday, 6 pm to midnight; Friday and Saturday till 1 am. Sunday to 11 pm.